A fun easy way to reduce waste and turn your thumb green is by composting with Red Worms. $40 gets you your own red wiggler worm farm. Includes bin, castings, red worms, and food. All you have to do is add your table scraps, shredded newspaper, and watch the worms do the rest. 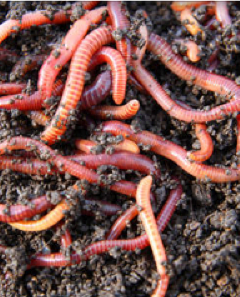 Red wigglers turn food wasted into castings and vermicompost tea for your plants, yard, and garden, and bait. I saw your web site on the computer and would like some information about your worms. I am from Alvin,Tx, just south of Houston and looking for local grown worms. I want some to put in my compost pile and also in our raised daylily beds. I would like to know what kinds of worms you have, what kinds would you recomend, your prices and where do you raise your worms? I would appreciate hearing from you.